SUBJECT: Seizure of ivory in Hong Kong. Document with the names of the three consignees. ACTION: Researched for one year. Shared with one journalist and an international law enforcement agency. In June 2014 WildLeaks received an anonymous message via our Tor based secure platform. The submission came most likely from Hong Kong and included a picture of a custom document regarding the seizure of 769 kg of ivory from the Ivory Coast, in October 2013, hidden in soy beans (click here to read more). Nan Hai Luen Fat Metal Trading Co., located in Foshan City, Guangdong, China. Honest Trading Co., possibly located in 28-36 Wing Kut Street, Central, Hong Kong. 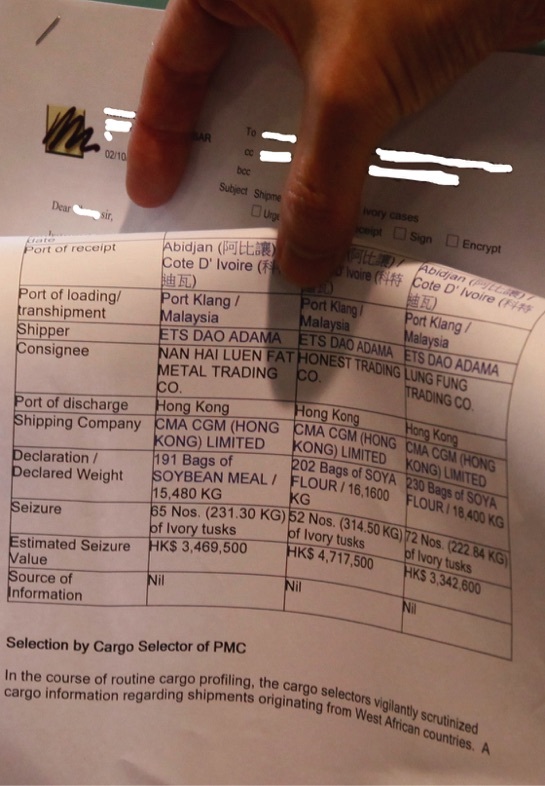 These three companies, specializing in businesses that typically are not associated with importing soy beans from African countries (metal and toys manufacturing), were listed on an official form from Hong Kong Customs as the consignees to accept a shipment of soya beans from Cote d’Ivoire. Most probably someone in or close to these companies use the import license to smuggle ivory from Africa, a common trick. For several months we have been tried to acquire more information about those companies. We also tried to find out if there is any judicial proceeding brought against those companies. We are curious to know what Chinese authorities have done with the handling of this information; Are any of the companies involved? Have any prosecutions resulted in fines or custodial penalties? Have there been additional links to other imported goods used to smuggle ivory and support the illegal market in Hong Kong in China?